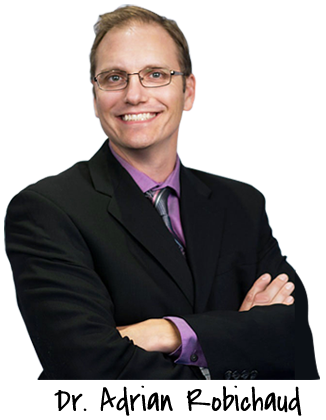 At Robichaud Chiropractic & Orthotics, Oshawa Chiropractor Dr. Adrian Robichaud is focused on helping you achieve incredible results. You can relieve your pain, make a full recovery of your health and maintain your well-being in the future with natural health care. Since 1999, Dr. Robichaud has been dedicated to helping his patients get more out of life. You don’t have to accept being held back in life by sickness and discomfort. We offer you a solution that is free from medications, completely nonsurgical and can alleviate many common types of musculoskeletal conditions. As a fifth-degree black belt, Dr. Robichaud has a deep understanding of the demands athletics place upon the body and sees fellow martial arts practitioners and those participating in all types of sports. To get started, contact our practice today. We welcome the opportunity to meet you and evaluate your needs. You can find out more about Dr. Robichaud, explore what the initial visits to our practice involve or fill out paperwork that can be brought with you to your first appointment. Check out what our patients have to say to discover the many health concerns Dr. Robichaud has been able to help with! Very comforting to know that if I could not be helped there that someone else can help. Relaxed atmosphere and perfect experience for a first timer! I enjoyed the informative and caring tone by Dr Robichaud. Things are looking up in relieving the pain in my shoulder. I experienced relief from pain I was experiencing after the first visit! I wish I had made the appointment months ago! To-date, I have had 2 meetings with his practice and I have already felt the difference. I am self-employed, and with that being said, if I don’t work, I don’t get paid. 2 days after meeting with Dr. Robichaud, I am now able to get back to work. Thank you immensely. It’s nice to be able to walk around the block and not have my back feel sore! Doctor Adrian was very knowledgeable and helpful, will definitely be back! No improvement is needed!! Such a great place..warm and friendly! And an amazing chiropractor. Thanks for all that you do!